Serve It Up! Championship Volleyball in Tampa Tonight! Its finally here folks! 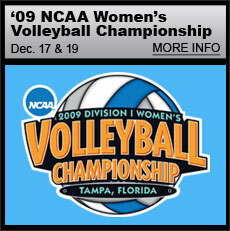 The 2009 NCAA Women&apos;s Volleyball Championships will kick off tonight at the St. Pete Times Forum when the University of Texas Longhorns take on the Minnesota Gophers at 7p.m. tonight followed by our second semi-final of the evening which will see the University of Hawaii Rainbow Wahine versus undefeated Penn State Nittany Lions! The atmosphere is going to be electric tonight as the Wahine will be looking cause what could be the biggest upset victory in college sports this year with a win over the 36-0 Nittany Lions, who by the way have not lost a match in over 100 attempts! There will also be a bit of a local flavor tonight when the Gophers take on the Longhorns in the first match of the evening. Tampa native Christine Tan will lead Minnesota&apos;s out on the floor tonight in her hometown. Jerm will no doubt be in attendance tonight and tweeting live from the floor with all of the action from both games. I am a bit rusty on my Volleyball lingo so you may have to excuse me if I am a little rusty in that regard! I also have some tickets that I will be giving away tonight for Sunday&apos;s Under Armour High School All American game at the Forum on Sunday at 1p.m. Stay tuned tonight and be on the lookout for more Championship level things to do in Tampa Bay! P.s. Get your St Pete Times Forum tickets here if you haven&apos;t already don so! Check out the newsletter as well for all of your game day info needs!